BANGI, 8 Feb 2014 – There has been a growing apathy and lack of affection in families in the country leading to the problem of disaffected youth becoming serious. 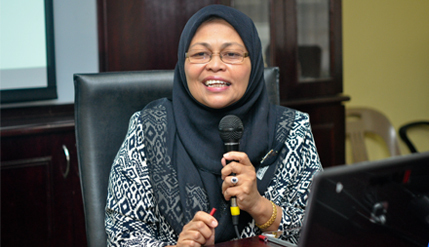 Prof Dr Zuria Mahmud of The National University of Malaysia’s (UKM) Faculty of Education said something must be done to arrest the phenomena. She was delivering her public lecture on Parenting Skills: Practice Noble Values Early On here today. She said parents are the role models for their children and should outwardly show their youngsters that they care and love them, rather than just be the masters or providers of material things. Prof Zuria said her research showed the phenomena is becoming more serious leading to increases in the problem of disaffected youth. She said the problem starts at the extremes of parenting. On one hand there are parents who are over-domineering, while on the other hand many parents take a laissez-faire attitude and give too much freedom to their children. However, like all parents they do love their children and think that they are doing the best for their offsprings. She noted that many parents are embarrassed at showing open affection to children. Actually, she stressed, children need a lot of affection and must be reminded that their well-being matters. Speaking from personal experience and interviews with students and teachers, she said she met many youths who lament that their parents don’t care what they do outside the house. Prof Zuria said one doesn’t need to go very far to see the worrying trend of groups of young children wandering in shopping malls without adult supervision. “I came across some of these boys and asked one of them whether his mother knew where he went. He replied that his mother didn’t care as long as he didn’t get into trouble,” she said. The excuse was that they lived at council flats and didn’t have any place to play or enjoy themselves. She also warned parents not to be physically abusive towards their children. Prof Zuria said children who suffer regular beatings grow up to be resentful of their parents and are less likely to care for them in their old age. She explained that the behaviour of adults and the direction they take in life are influenced by how their parents treat them as children. Commenting on university students’ lack of motivation, she said, they may have lost interest in the courses they signed up for. She urged parents to encourage their children take up subjects that they like as well as taking part in sports. She cited peer influence as an important factor over youths in colleges which can lead them to do things that would be of concern to their parents. This is when the parents should step in and show that they care and love them, at a time when they become vulnerable to social problems. “Actually, troubled students need the support of all parties and allow them the opportunity to tell their side of the story and express what is on their minds,” she added. Her research found that students prefer to talk about their problems to counsellors rather than their parents. That’s because parents frequently brush aside their children who want to talk about their problems. Parents must be ready and willing listeners of their own children, she said. On collaborative efforts in addressing social problems among students, Prof Zuria said counsellors should have a good relationship and cooperation with teachers, school administrators, the police, non-governmental bodies and hospitals.